“Desolation Wilderness” follows two friends as they seek inspiration outside the academic institutions they find so restrictive. Their experiences, rewarding at first, become increasingly battered by influences beyond their escape. The film praises art and the creative, lecturing that one must shun popular art and contemporary means in favor of engaging the naturally inspired sanctuaries of the world around you. It is a philosophy applied to and promoted within the film. Robby Massey and Derek Mungor comprise the creative team on both sides of the camera in this effective art house horror. The film opens on the road, with our main characters Noah (Massey) and Russell (Mungor) engaging in small talk, pit stops and farewells to the big city. Their destination and intentions are not immediately clear, but it is these questions, along with their natural dynamic, that make for an enjoyable, albeit wandering, beginning. We are granted a mild sense of unease generated by the mystery of their actions and the peculiarity of their interactions. At a grocery store, they encounter a cashier seemingly automated in his responses. It is the introduction of atypical and it’s a big part of this film. Desolation Wilderness – Final Trailer from Desolation Wilderness on Vimeo. The remainder of “Desolation Wilderness” pays full respects to its title. Far removed from the distractions of city life, the characters eat, sleep, work and play while their perceptions of reality begin to fail. Increasingly odd behavior between the two builds to a wholly maddening climax. And therein lies the horror. While much of the film is seemingly mundane, slice of life type cinema, it is peppered with just enough weirdness to nurture a curious anticipation of things to come. 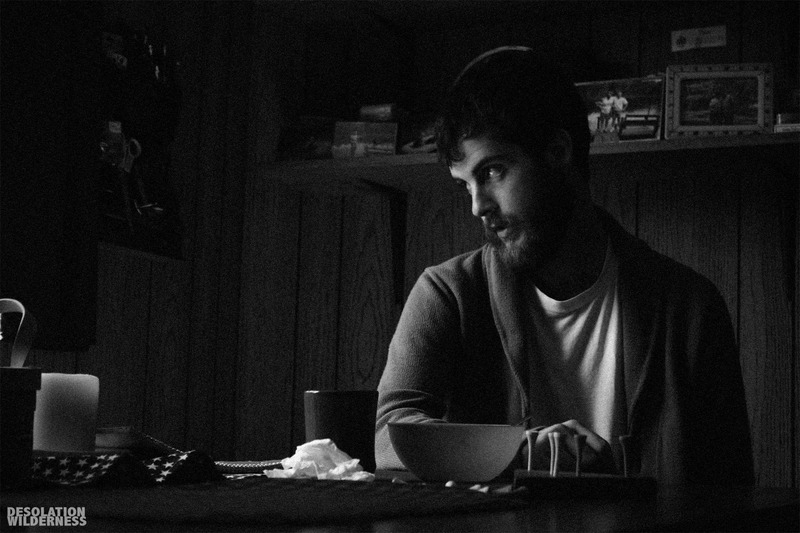 The film is beautifully shot and rendered predominantly in black and white. Sound design could be called minimalist, sometimes intriguingly selective. It bows out several times throughout the film in favor of mimed actions and dialogue. By the end, it has evolved into a series of drones that carry the viewer through a Lynchian sequence of images that are as gripping as they are perplexing. The camera, direction and pacing contribute to the roving feel of the entire film, along with the oft-employed montage. What initially strikes you as a presentation of happenstance in the most carefree of ways slowly descends into a surrealist nightmare punctuated with folk music videos. It is a unique film and it’s definitely not for everyone. Massey and Mungor turn in authentic performances with natural and spontaneous dialogue that can be credited to finely executed improvisation. In the film’s more bizarre moments, all communication is prolonged with heavy use of dramatic pause. It is out of the ordinary, but not out of place, and helps achieve that which too few films strive for: to be disturbing without being grotesque. “Desolation Wilderness” is an oddity. As a film, as a horror film and as art, it has few defining features, endless interpretations and a seldom seen composition of patterns, images and feelings uniting for a whole that is not easily defined by genre or category. It is engaging, disorienting and scary. Although not a horror film in the traditional sense, it is very much so in the emotional sense. It elicits uncomfortable feelings from its alarming use of imagery, close quarters, the unexplained and a generally off kilter presentation of the world. It is intentionally ambiguous and encouragingly subjective. Want though we may, we are not provided a Rod Serling epilogue to ease our minds. If you’re in the mood for a dark, psychological film that, without any sense of urgency, somehow manages to feel oppressive, this is a unique outing. “Desolation Wilderness” invites as much consideration as you can spare long after the credits roll. 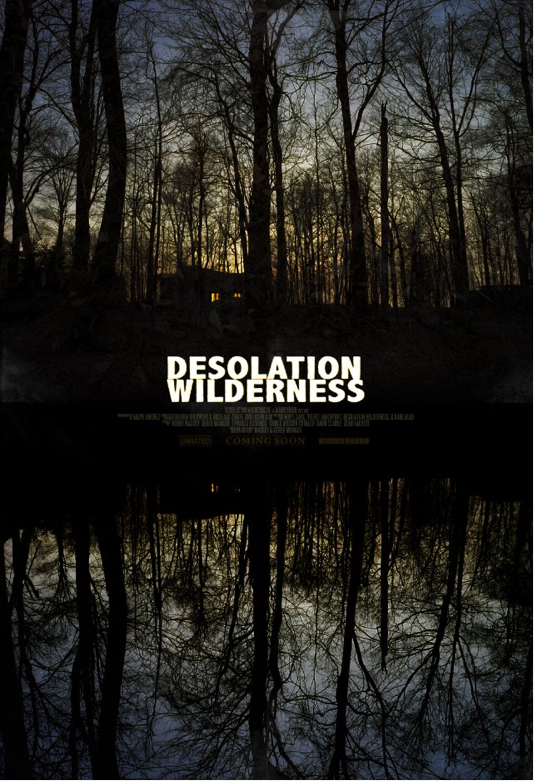 “Desolation Wilderness” will be available via a self-released DVD soon. Please follow this film on Twitter @enterdesolation. You can also check out the film’s official website. This review was written by Levi Caleb Smith. This entry was posted in LA Horror Review and tagged alone, desolation, horror, scary, trapped, wilderness, woods. Bookmark the permalink.